When I went back to our home in Tucson, AZ, this March 2009, I ordered up a 3000 watt electric motorcycle. I rode it up the steep mountain side to Mount Lemmon. Not a problem hauling my big self up there on that one! I liked it so much that before we got back to the Philippines, I ordered another unit of the same model to be sent to our Subic house. I ride around the even steeper hills of Subic Freeport with no problem! I had a saddlebag made for it while I was in the Philippines and ordered a trunk so I could carry my water bottles in it. You don't want to go too far in the deserts of Tucson, Arizona without an ample supply of water. Now Alsyha rides around with me and this Ebike doesn't feel it at all! This thing is a powerhouse! Even with Diana and me on it, it still zooms around just fine! I haven't tried riding around with me, Diana and Alysha yet though. It's been raining horses and buffalos until just three days ago. I outfitted this bike with flashing colored lights in the front to be seen better at night, and my DWG waterproof motorcycle speakers! We don't have to blast the speakers to hear the tunes! 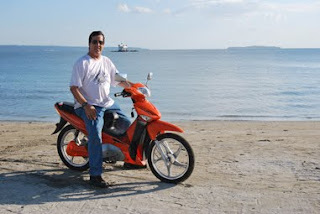 I bought my first 1000 watt electric motor bike from Eagle Motorcycles Philippines last year, 2008, to putter around on in beautiful Subic Freeport, in Olongapo, Zambales. It was such a joy to drive around on a motorbike that didn't choke me with fumes and best of all, it was so quiet! I was able to sneak up on all sorts of wild life that abound right off the paved roads winding through the forests around here. 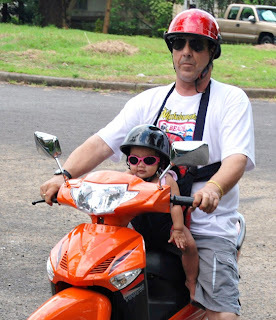 Our little surrogate daughter, Alysha, loved the motorbike from the first day I placed her on one! She is now a year older and is totally hooked on them. I didn't have any trouble going up the hills alone, even though the unit did slow down on the steeper hills, but now the baby is older and heavier, so I ride this unit alone now for errands. 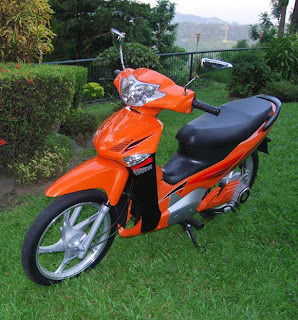 I have since bought a 3000 watt motorcycle that is capable of climbing the steep hills in Subic. 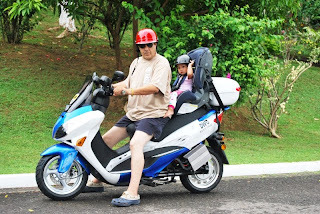 This way my wife Diana and Alysha can easily go along for my rides through the forest or to nearby restaurants and this e-bike doesn't slow down enough for me to care...although of course, being a previous owner of a Honda Shadow tourer, I am looking into the 5000 watt unit.